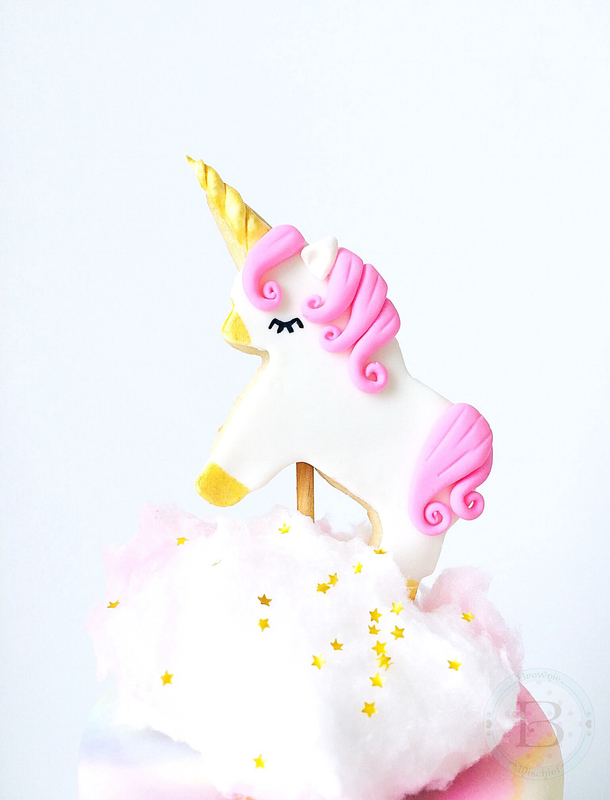 I used one of these magical little creatures on my Rainbow Marble Mini Cake. I also used them on the adorable mini cakes pictured below. They would also work as toppers on large cupcakes. If you would like to make these into cookie pops, use lollipop sticks, rather than skewers. You could also omit the skewers if you wish, and just bake a blessing of unicorn cookies. Preheat oven according to your recipe. Line a large cookie sheet with parchment paper. 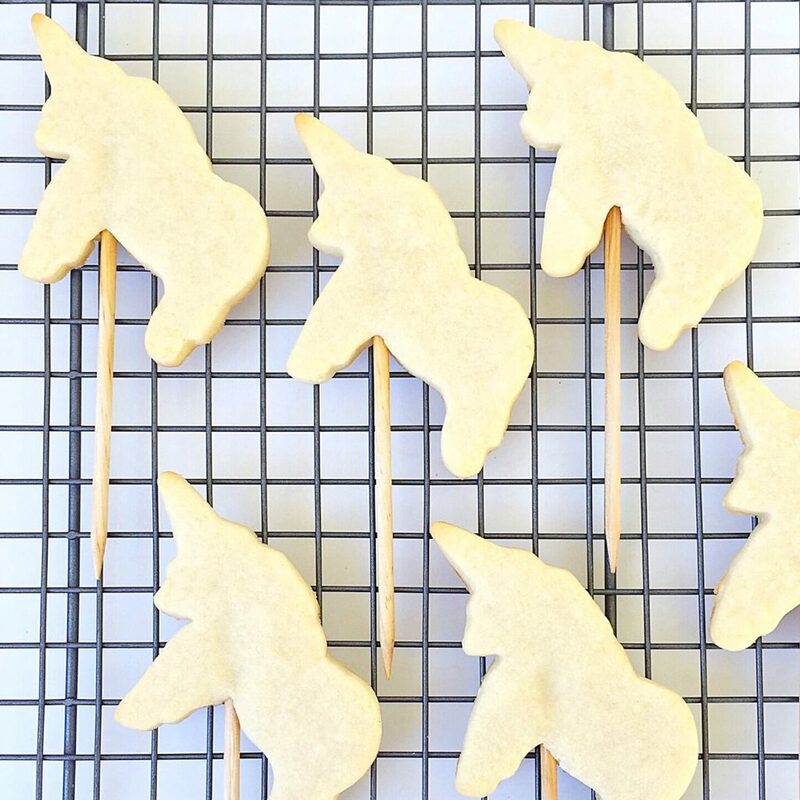 Roll cookie dough to 1/4-inch thick and cut out unicorns with cookie cutter. Place on prepared baking sheet, about 1-inch apart. Insert skewers about 1-inch into the unbaked cookies. (I like to insert the blunt end of the skewer into the cookie. This way the pointed end can be used to poke the cookie topper into the cake later.) Bake according to your recipe. Let cool completely before decorating. Roll out white fondant to 1/8-inch thick. Cut out a unicorn shape using the same unicorn cookie cutter. Cut off horn section as shown in photo. Brush a thin coating of piping gel onto the cookie. 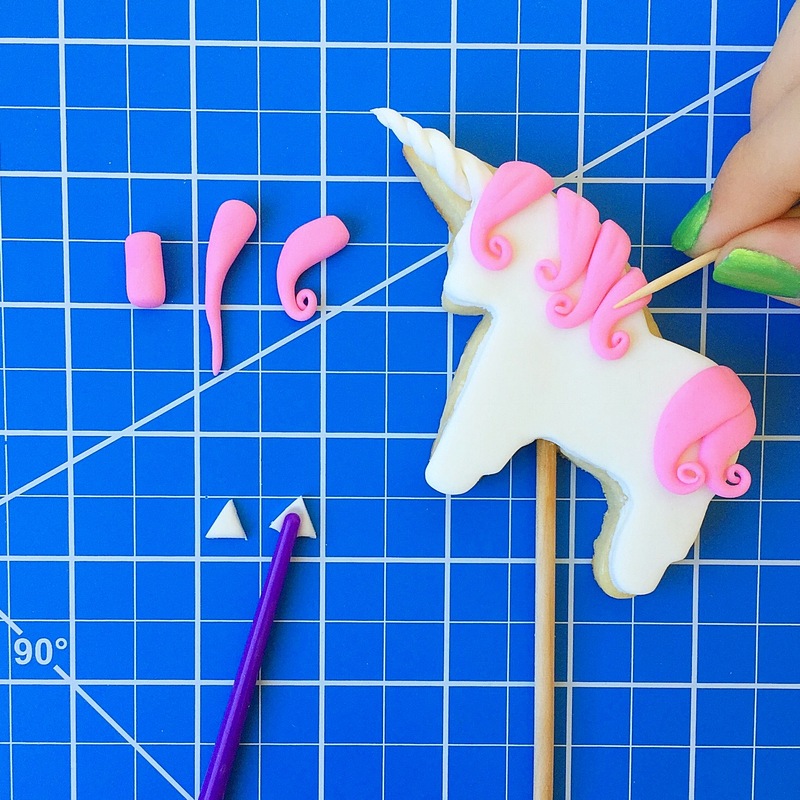 Apply the fondant unicorn cutout to the cookie. Smooth gently with a fondant smoother. Cut horn section in half, lengthwise. Roll and taper the end of each piece with your fingertips. Twist together to form the horn. Apply to cookie with piping gel. Repeat for each cookie. For the mane and tail, form 1/4-inch by 1/2-inch logs of pink fondant. Roll and taper them at one end with your fingertips, then curl the tapered ends. Apply the curls to the cookies with piping gel. Add lines to the mane and tale by gently pressing with a toothpick. 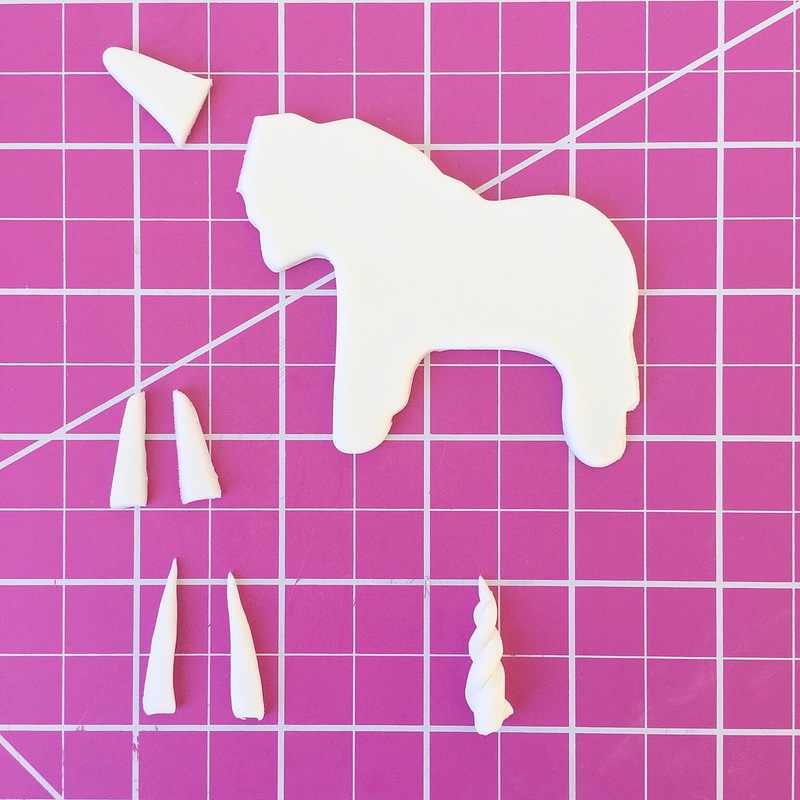 For the ear, make a 1/4-inch triangle for each unicorn. Press the end of a small paintbrush into the triangle to form an indent in the ear. Apply with piping gel. Let cookies dry at least 30 minutes. Mix edible gold luster dust with a bit of vodka or lemon extract to form a paint. Paint the horn, hooves and muzzle of each unicorn. (This may require 2 coats.) Draw the eyes with an edible marker. 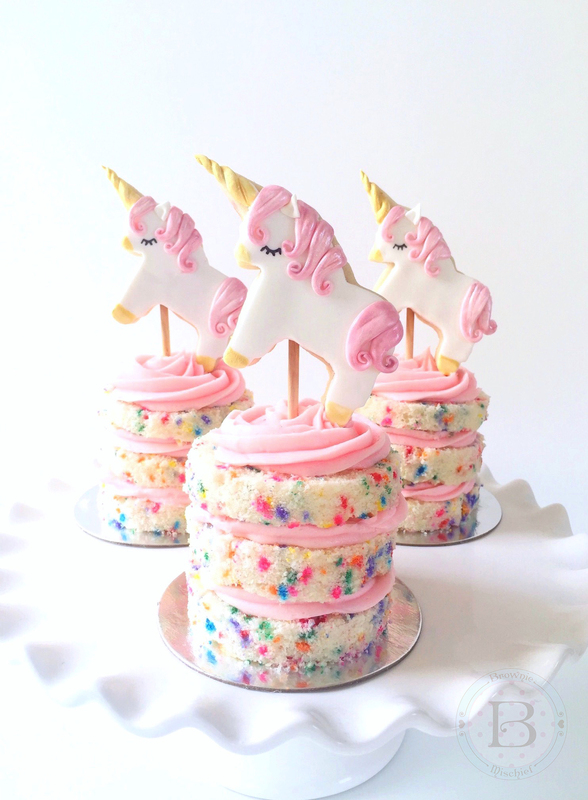 The mini cakes pictured above are 3-inch rounds of vanilla confetti cake layered with pink vanilla buttercream. I used Americolor Soft Pink gel food color to achieve the pretty pink buttercream.